The Cobbler is coming to a theater near you in March. Adam Sandler uses a magical sewing machine to save soles on the big screen, but did you know local cobblers, Bruce Berry and Marc Lobdell have been working their magic on Marion’s footwear every day for a combined total of 27 years? That’s right. Bruce Berry and Marc Lobdell are the real life version of The Cobbler, saving their customers’ soles every day. Lobdell, who manages Jerry’s Leather Shop and Shoe Hospital, learned the craft from Berry, who began working for the shop’s namesake, Jerry Wampler in Marion 24 years ago. They are part of a resilient group of craftsmen in an under-used industry. Angelos says only 25 percent of Americans regularly care for their shoes. The rest don’t recognize the economic, physical and environmental benefits of shoe repair. According to Lobdell, quality, well maintained men’s shoes can be resoled seven to 10 times at a fraction of the cost of new shoes. With new soles and heels, and reconditioned uppers, the shoes will look like new, yet retain that broken-in, comfortable feel. It is not uncommon for a man to get 30 years out of a good pair of shoes. Quality women’s shoes can be resoled three to five times. Shoe repair can also alleviate a variety of physical problems. Worn heels will change your gait. When you are not walking properly, your feet, ankles, knees, hips and back can all suffer. Once Bruce or Marc works their magic, balance is restored. Improper fit causes calluses, corns and bunions. Jerry’s Leather Shop and Shoe Hospital offers stretching services and fitting aids to alleviate those problems. Typically, they can stretch a shoe from a D to a EE in width. They can also add more space for toes or raise an instep. They can even stretch the calves on boots. If your shoes are too loose, you can pick up heel grips, tongue pads and insoles to create a better fit. Finally, shoe repair is among the oldest forms of recycling. Each year, the shoe repair industry keeps some 62 million pairs of shoes out of landfills and on consumers’ feet. 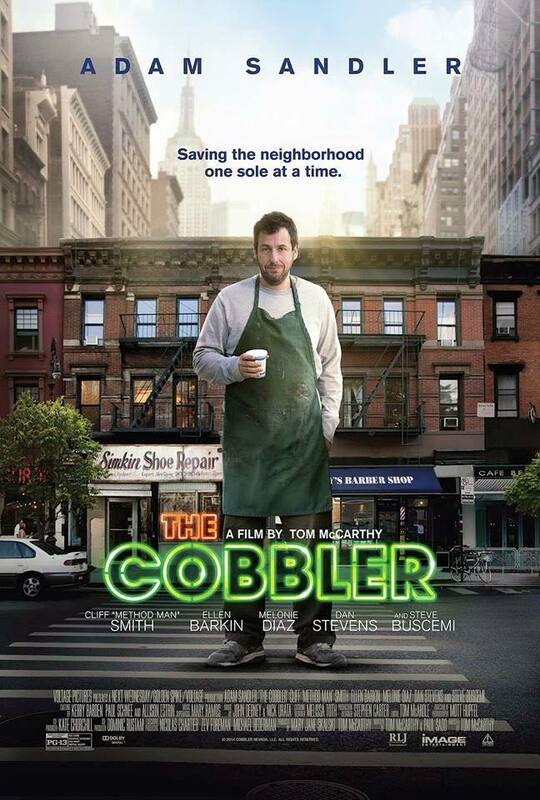 On the big screen, The Cobbler is about Sandler using his magical machine to walk a mile in other peoples’ shoes. At Jerry’s Leather Shop and Shoe Hospital, Bruce and Marc use their magic so their customers can walk off into the sunset and live happily ever after, or at least until it’s time for another visit.